Residents need to know that not all ticks cause human disease, but certain species of ticks can carry the bacteria that causes Rocky Mountain spotted fever or Lyme disease. It is always best to avoid ticks if possible, and at the same time become familiar with tick borne diseases and their symptoms. 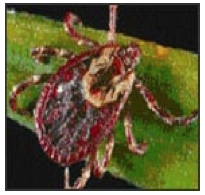 The American dog tick is the primary carrier of Rocky Mountain spotted fever in the eastern United Sates. In Ohio, this tick is widespread and abundant. It will bite and feed on any available mammal, including humans. The bacteria that cause Rocky Mountain spotted fever is transmitted to humans through the tick’s saliva while feeding. Only one to three percent of the tick population carries this bacterium, so risk of exposure to an infected tick are pretty low. early, Rocky Mountain spotted fever is treated with antibiotics. If left untreated, it can be fatal. Lyme is a bacterial disease caused by a spirochete-type bacterium. Lyme disease is transmitted by the black legged tick, also known as the “deer tick”. 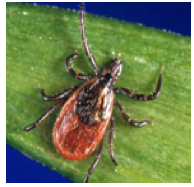 This tick is commonly found in areas of deciduous forest and especially with leaf litter. This tick is rare, but has been found - which means they are being imported into our area through migratory birds, animals and pets that travelfrom one area to another. In its early stages, Lyme disease is commonly treated with antibiotics. Having Lyme disease once, unfortunately does not protect against re-infection. Note that people cannot get Rocky Mountain spotted fever or Lyme disease from another person. 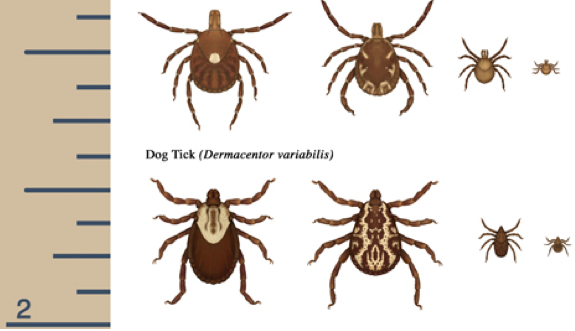 The disease is only spread through a tick that is infected with the disease. Remove the tick as soon as possible - this reduces your risk of infection. Use tweezers, as close to the skin as possible, and pull with steady-even pressure. Do not twist or jerk on the tick. Try not to crush or puncture the tick or use a cigarette to remove it. This may cause the tick to burst and increase disease risk. After you remove the tick, thoroughly disinfect the bite site and wash your hands with soap and water. ** This year, the Ohio Department of Health is no longer testing ticks. Therefore, the Fairfield Department of Health will no longer be collecting ticks for testing. Also, be aware of the symptoms of tick borne diseases and see your healthcare provider if you experience these symptoms. cling to fur or clothing and look for a place to attach and begin feeding. Contrary to popular belief, ticks don’t fall out of trees - they climb up to your head and attach to your scalp. So, if you go into these places, tuck your pants into your sock tops or boots. Wear light colored clothing to make it easier to see ticks. Use repellants and follow their instruction carefully. Check your dogs that have been outside. Keep your yard and outdoor play areas well mowed to discourage tick infestation. • Stick to main pathways and the center of trails when hiking. • Wear long-sleeved, light colored shirts and long pants tucked into your socks. • Use repellents that contain DEET on your clothes or exposed skin. • Use repellents that contain permethrin on your clothes. • Keep grass cut short. • Remove leaf litter and brush from around your home. • Prune low lying brushes to let in more sunlight. • Keep woodpiles and bird feeders off the ground and away from your home. • Plant trees or flowers that do not attract deer and install a fence to keep deer from entering your property. toes, back of the knees, groin, armpits, neck, and behind the ears. also known as the "deer tick,"
• Wear long-sleeved, light-colored shirts and long pants tucked into your socks so you can see the ticks. • Prune low lying bushes to let in more sunlight. • Check yourself for ticks first and then other family members and pets. Check along the hairline, between the toes, back of knees, groin, armpits, and neck behind the ears. If you find a tick attached to your skin, the best way to remove it is to grasp the tick with tweezers and gently pull until the tick is removed. Don’t squeeze or crush it when pulling. Do not use a hot match on the tick. This may irritate the tick and cause it to hold on more tightly. Don’t pull too hard or you may leave mouth parts in your skin. Once the tick has been removed, disinfect the site and make sure you wash your hands. Starting in 2013, the Ohio Department of Health will no longer conduct the tick or mosquito identification programs.